Astronomy is the study of celestial objects and phenomenae that occur outside Earth's atmosphere, such as moons, planets, galaxies, nebulae, black holes, and supernovae. It also encompasses the physics, chemistry, and evolution of those objects and events. The word "astronomy" is comprised of two Greek word roots: "astron" ("star") and nomos ("law" or "culture"), thus translating to "law of the stars" or "culture of the stars". Artifacts dating back to prehistoric societies shows evidence of ancient astronomical observations, thus making astronomy one of the oldest sciences. Early observations were limited by what humans were able to see with the naked eye. The interest of the night sky in those times was also likely enhanced by the fact that the skies were significantly darker due to the lack of electricity and atmospheric pollution. With the invention of the telescope in 1608 by three Dutch scientists (Hans Lippershey, Zacharias Janssen, and Jacob Metius), the ability to see smaller and fainter objects moved the science of astronomy forward in a significant way. Over the centuries, new engineering and optical technologies were added to make telescopes better, sharper, and larger, but all are ultimately derived from those early refractor and reflector telescopes. The first practical reflecting telescope was built in 1668 by Sir Isaac Newton. This design is used today and is aptly referred to as the "Newtonian reflector". It is important to note that astronomy is quite different from astrology, and most astronomers (and scientists in general) have rejected astrology as a pseudoscience. 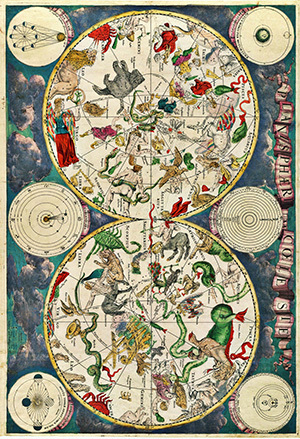 While Astrology is derived from concepts of astronomy (particularly the moon, sun, stars, and constellations), it is more appropriately described as a belief system rather than a science. Specifically, astrology is the belief that there is a relationship between astronomical phenomena and events in the human world.